Living in a vibrant metropolis like Toronto with all its summer festivals and street parties is exciting, but every once in a while it’s just time to get away from the big city into the countryside. 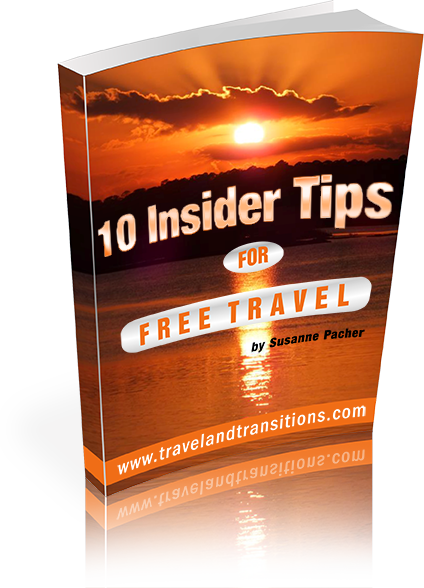 I was looking for a place that would not be too far away and would be easy to get to without traffic jams. After consulting my Ontario map I had found my destination: Grey County, an area that stretches roughly from around Collingwood past the picturesque towns of Thornbury, Meaford and Owen Sound to Wiarton. The region is located on the beautiful shorelines of Georgian Bay. The other huge natural attraction of Grey County is the Niagara Escarpment, a designated UNESCO World Biosphere Reserve due to its unique fauna and flora. 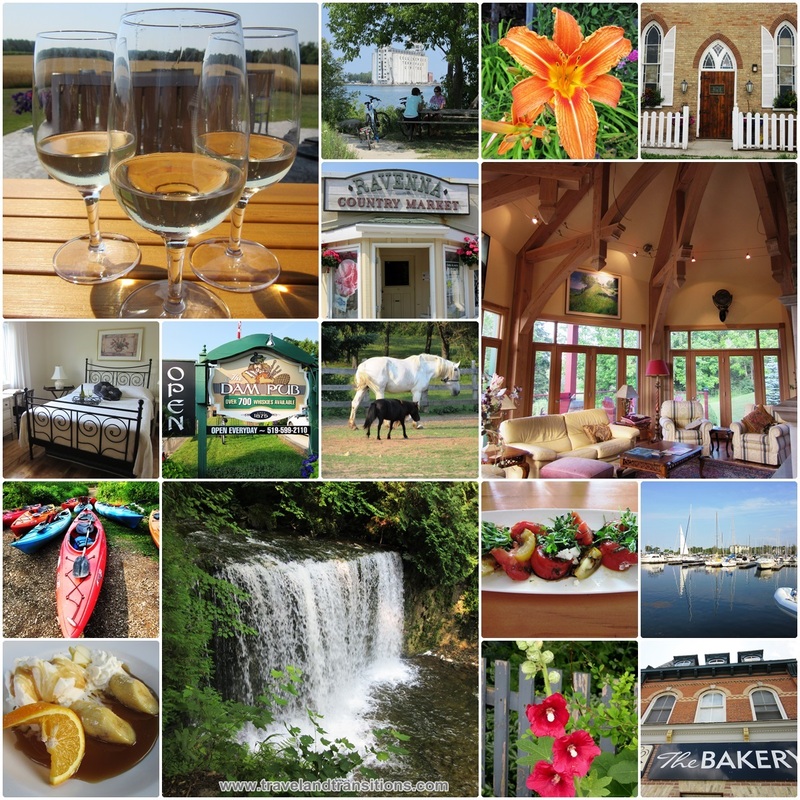 Grey County enthralls its visitors with stunning landscapes; cozy country inns and bed & breakfasts; fabulous restaurants, cafes and pubs; luxurious spas and a wide range of cultural offerings. Waterfalls and historic mills are dotted throughout the region, some of which have been turned into restaurants or art galleries. Year-round outdoor activities are limitless and include sailing and other water sports, hiking, biking, horse riding, paddling, caving, rock climbing, golfing and more. During the winter the region becomes a playground for downhill and cross-country skiing, snow shoeing and snowmobiling. With several wineries and cideries, the area has become an emerging destination for wine lovers and the Apple Pie Trail entices travellers to taste the delicious offerings of Ontario’s Apple Country. Given all these diverse opportunities I was definitely looking forward to my stay in Grey County. So for my country getaway from Toronto I headed out with a friend for a two and half day excursion into Grey County, a region just about an hour and a half northwest of Toronto. After a pleasant country drive without any traffic jams we arrived at about 11 am in the little village of Eugenia Falls and were ready to embark on our first adventure: a guided bicycle tour with Pete Russell from Georgian Bay Cycling Tours. 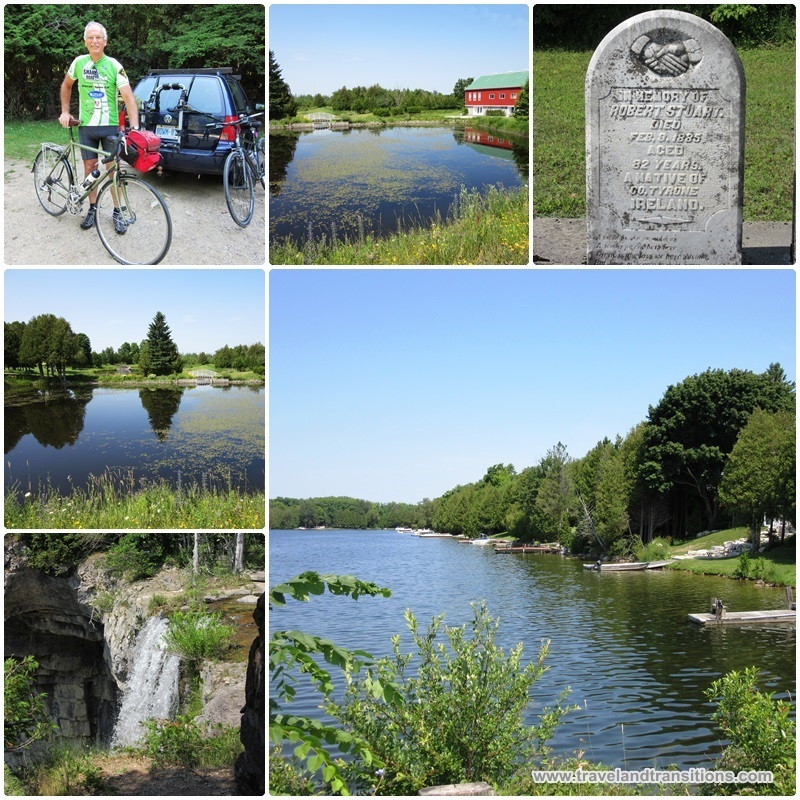 The entire Grey County region offers fabulous bicycle routes and our round trip around Eugenia Lake would give us a taste of the local biking opportunities. Pete, a retired marketing manager, had two comfortable bikes ready for us, so we headed out into the rolling countryside surrounding Eugenia Lake, an artificial lake that was created in the early 1900s as part of a hydro-generating project. Today, the scenic lake is often referred to as the “hidden Gem of Grey County”, and it is popular with boaters and cottagers. In his congenial way, Pete provided us with all sorts of interesting information about the area. Along our way, we passed by a memorial to early Irish settlers that first came to this area in the 1850s. After the bike ride I checked out Eugenia Falls, a very pretty waterfall where the Beaver River plunges more than 30 metres down the steep limestone cliffs of the Niagara Escarpment. Once a thriving village during the “Fools Gold” rush of the 1850s, Eugenia Falls today is a conservation area with 23 hectares of protected valley and forest scenery that offers great hiking opportunities. 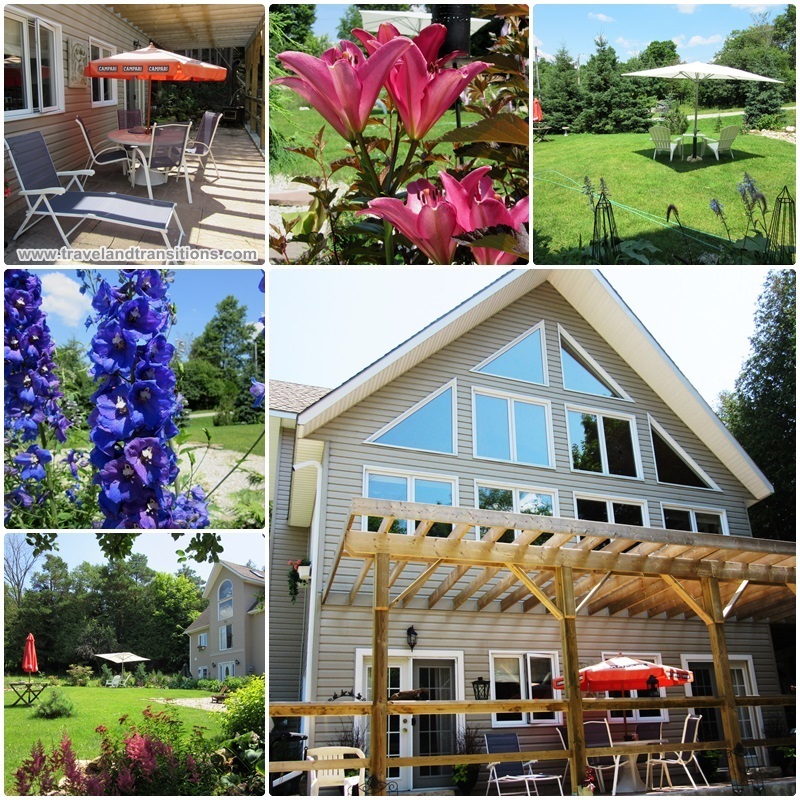 After our bicycle tour we checked in just minutes away at the Guesthouse at Eugenia Falls, a charming bed and breakfast that is located on one of the highest points in Ontario on top of the Niagara Escarpment. Hosts Rosanne Caruso and Wolfgang Müller have created an enchanted retreat in the forest that surrounds Eugenia Falls. The B&B is located inside a modern house with striking panorama windows and an attractive porch that is adjacent to two of the guest bedrooms. Wolfgang, a professional gardener, has created a colourful oasis of flowers in the garden where guests can relax and enjoy the tranquility of the country. 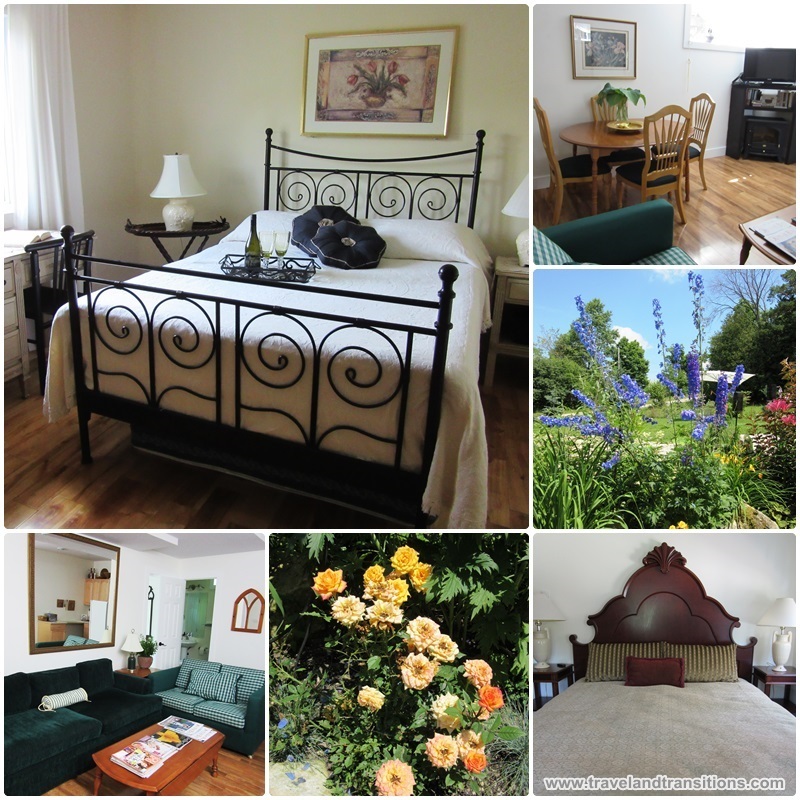 Rosanne Caruso welcomed us inside her tranquil retreat at the Guesthouse at Eugenia Falls and showed us all the amenities. I settled down in the serene north bedroom with its king bed and walkout to the patio while my friend stayed in the south bedroom with a comfortable queen bed and access to the patio. Both bedrooms share a joint bathroom and a living area with television, a mini-kitchen and dining area. A 3rd bedroom and an additional bathroom make this floor a perfect getaway location for larger families or several groups of friends. Lots of DVDs and magazines are available to entertain the guests in case the weather doesn’t cooperate for outdoor activities. We had found a great place to stay for our first night in Grey County.